The story: Bridal Whispers Maila Holmes was told at sixteen that they had too many mouths to feed and to go make her way in the world. She was given the amethyst glass tole-painted pitcher and tumbler set as her "inheritance" as she left for nursing school in St Paul. Ten years later she's called home to help the family that pushed Maila out into the cold. Burton Rutherford loved Rose and believed in “Till death do ye part.” But he didn’t expect it to come so soon and become a widower at 35. Maila, Rose’s cousin, hurt for Burton’s loss, and her own, after several family members succumbed to double pneumonia Christmas of 1899. But when the town gossips about the kept woman, can two very different people from very different backgrounds and beliefs become one? 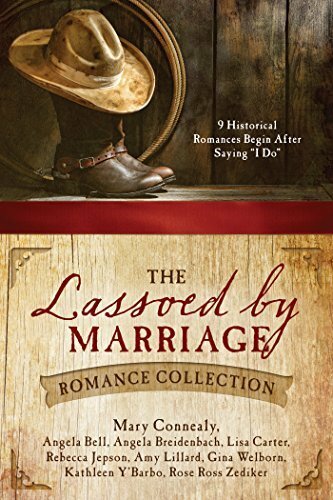 Read Lassoed by Marriage to find out! Maila Holmes was told at sixteen that they had too many mouths to feed and to go make her way in the world. She was given the amethyst glass tole-painted pitcher and tumbler set as her “inheritance” as she left for nursing school in St Paul. Ten years later she’s called home to help the family that pushed Maila out into the cold. 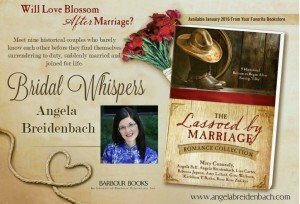 Check out these blog posts to see the historical artifacts that inspired Bridal Whispers in the Lassoed by Marriage Romance Collection including an 1864 saddlepack Bible and the amethyst handblown Swedish pitcher.